This newsletter will keep you informed about ways to reduce utility costs while conserving resources. 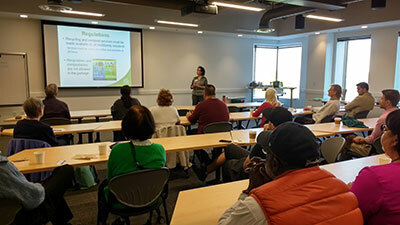 Property managers learning how to improve recycling and food waste collection at a workshop. Are you interested in improving the recycling and composting program at your building? If so, join us for a free training for property managers and staff. When: March 30th from 10:00 AM – 12:30 PM. Where: Smart Buildings Center (Pacific Tower: 1200 12th Ave S. Suite 110, Seattle WA, 98144). Parking will be provided free of charge. Bus lines 36 and 60 stop outside the venue. Benefits: Properties that have a solid waste account with SPU can receive free kitchen food waste baskets (if they haven’t received them in the past). For more information or to register, please contact Paul Klein at paul.klein@seattle.gov or by calling (206) 733-9068. Save money and improve tenant satisfaction with energy saving updates. Many of our customers have taken advantage of free energy-saving products from Seattle City Light to help tenants save money by reducing their electricity use. 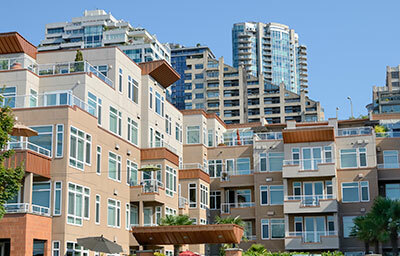 Seattle City Light offers installation of free energy-efficient LED bulbs, and delivery of efficient showerheads and faucet aerators for tenants of residential buildings with five or more units. We even provide energy-saving advanced powerstrips that can’t be found on store shelves to help tenants power off cable boxes, game consoles, and TVs when not in use. Call us today at 1-877-311-8752 to see how you may be able to participate. For more details, visit seattle.gov/light/install. Order flyers and posters in many different languages to educate your residents. Order Where Does It Go? and Food & Yard Waste Tips flyers for each unit and post extras in common areas such as elevators or mail rooms. Do you need help improving your building’s food waste and recycling collection? Would you like for us to visit and talk with you and your residents? If so contact Paul Klein at paul.klein@seattle.gov or by calling (206) 733-9068. Report a missed collection online or by calling (206) 684-7665. You can also request changes to your carts and dumpsters by calling this number. Call our Customer Service line at (206) 684-3000.